Tried This Cute Punjabi Bagh Bakery’s Cold Coffee & Nutella Bread Yet? 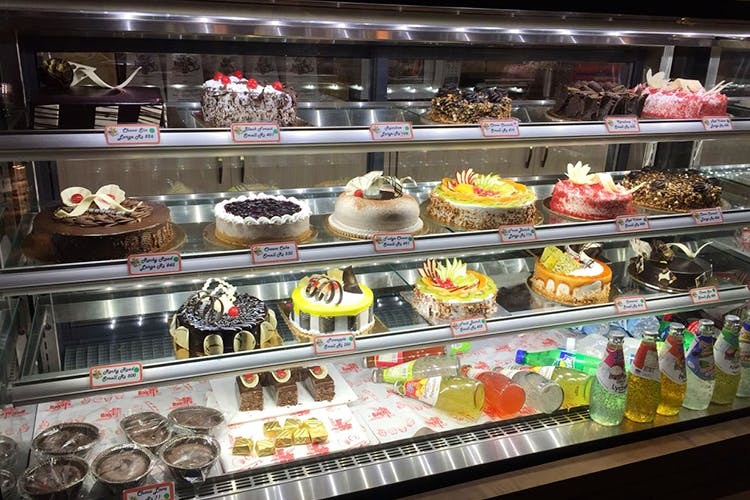 Baker’s Stop, with its three branches has garnered its fair share of love, but it’s the newest one in Punjabi Bagh that takes the cake. With a huge selection of sweet and savoury bites, it’s a good pit-stop for when you want to pick up some breads and puffs for brekkie, or grab a brownie for the road. We don’t know about you, but cosy bakeries (all wood and smelling of freshly baked bread) make us go weak in the knees. And, the one in question, is a tried-and-tested Punjabi Bagh gems. It’s a world away from dingy, chaotic pubs, and serves unpretentious comfort food without the unnecessary frills (and frosting). And how do we know all this? Well, one fine morning, we were greeted with boxes of Cornflakes cookies, brookies (brownie-meets-cookie), chocolate fudge cake and other goodies. Before we knew, we’d polished off a fudge cake like we’d taken it as a challenge. Another popular dessert on the table were the Cinnamon French Hearts, a perfect accompaniment for our evening chai. These crunchy delights really hit the sweet spot with caramel-y, toffee-like layer of sugar on a flaky base. In all, our day was made a whole lot sweeter with these presents. Cutting down on sugar? Their famed Chicken Bun has a fan following of its own; it’s a kind of a must-try. A lot of hungry snack seekers throng this nook to pick up loaves of garlic bread and stuff their face with Choco Bombs (it’s molten chocolate bundled inside a chocolate shell) too. Oh, and that Nutella Babka bread. Sigh. Ask them, and they’ll tell you that their dry cakes fly off the shelves. At any given point in time, they also stock ready cakes if you need a birthday cake at the eleventh hour, you know. Try their Orange Velvet (Red Velvet is so mainstream) or Masala Tea Cake, or hit them up with a customised cake order. Our friend from the hood tells us that this cute lil’ haunt’s cold coffee and Butter Chicken Hot Dog are to die for. Try out her recommendation? P.S. Don’t forget to pick up a loaf of their wheat bread, because they promise to be one of the few folks that use only atta to make it (others mix it with other grains/flour). They don't have any dairy-free options, for our vegan friends, so you might be disappointed.